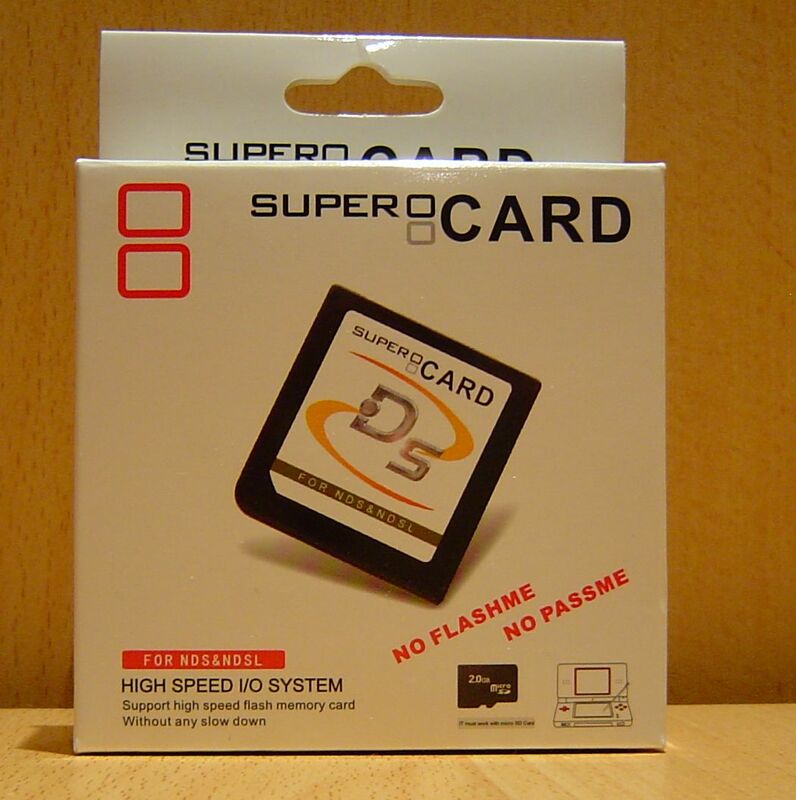 DS-Scene - View Topic: Supercard DS (One) Official Review - Read the official review inside. DS-Scene Forum Index DS-Scene Official Hardware Reviews Supercard DS (One) Official Review - Read the official review inside. Supercard DS (One) Official Review - Rea...cial review inside. Well my review unit for the Supercard DS turned up today from kicktrading.ca. It's very exciting for me because I have stuck with one DS solution for such a long time so this should hopefully open my eyes to other possibilities. 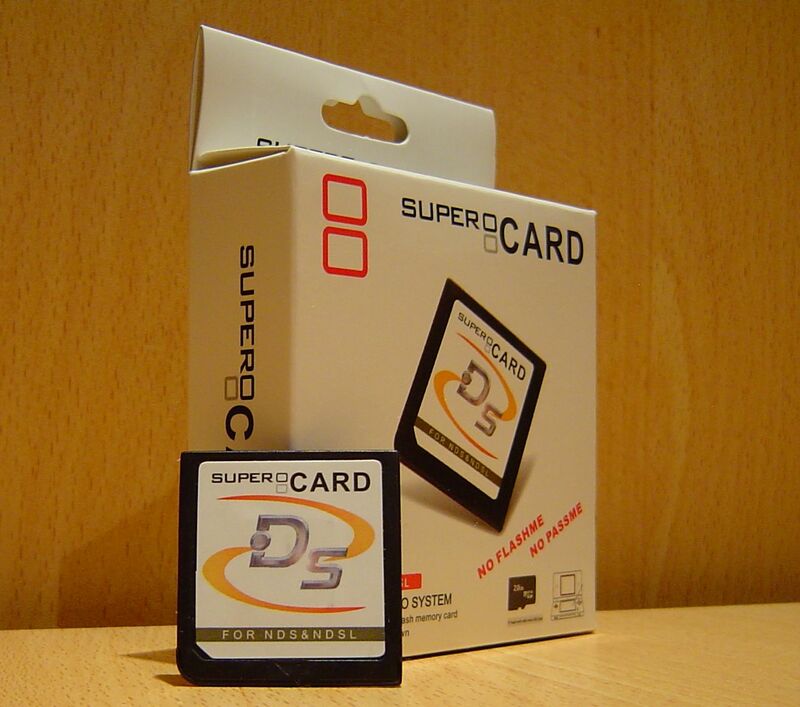 Supercard has produced many solutions for the DS and in the past has provided very solid products with great backing. They provide quick updates to software and firmware and are very highly regarded in the DS Scene. The unit is supplied in a standard cardboard box, with a plastic inlay which holds the cartridge. Nothing else is included in the box. It doesn't include an information leaflet or a driver CD. I think maybe they could have included a small info sheet and perhaps the current OS so the user could get up and running without having to fine the download on the internet. On the whole the packaging was very professional but definitely lacking in other areas. 1. Plug 'n Play(No FlashMe, No PassMe, No convert). 2. 100% Clean Rom Support. 100% game compatibility. 3. No PC software required, just Drag 'n Drop file from PC to flash memory card. 4. Hardware save support. Easy to backup and exchange save with other players. 5. Support FAT/FAT32 up to 32Gbits flash memory card. Flash memory card can be used on other digital products, save money. 6. Blue-Light engine included. Support High speed flash memory card without any slow down. 7. 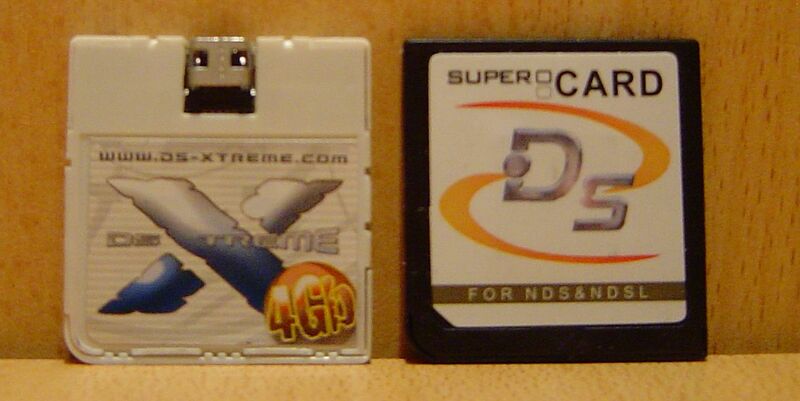 DS original cartridge size, the perfect solution of slot 1. 8. TFlash/MicroSD slot Push'n Push design, easy to use. 9. Micro firmware designed, and extended skin which is fully upgradeable. 10. MoonShell built-in design. 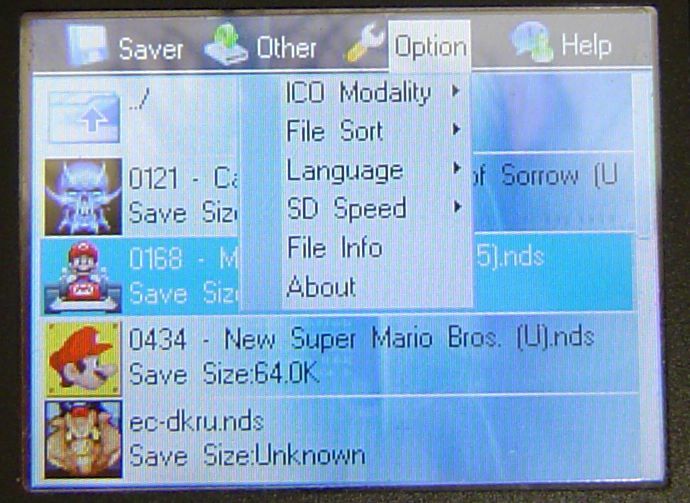 Can play MP3, Ogg and DPG2 directly in SuperCard DS system. Compatible with DPG0/DPG1. It also support eBook and view picture. It's a real multimedia system. The Cart itself is very solid. To me it looks and feels like a exact replica of an original DS cart. Very solid and does not bend or creak. Even without the MicroSD card inserted, the space around it is very well supported. As it's the same size as a commercial DS Cartridge, it has a nice flush fit as demonstrated in the above picture. It's amazing what they can cram into such a small place. 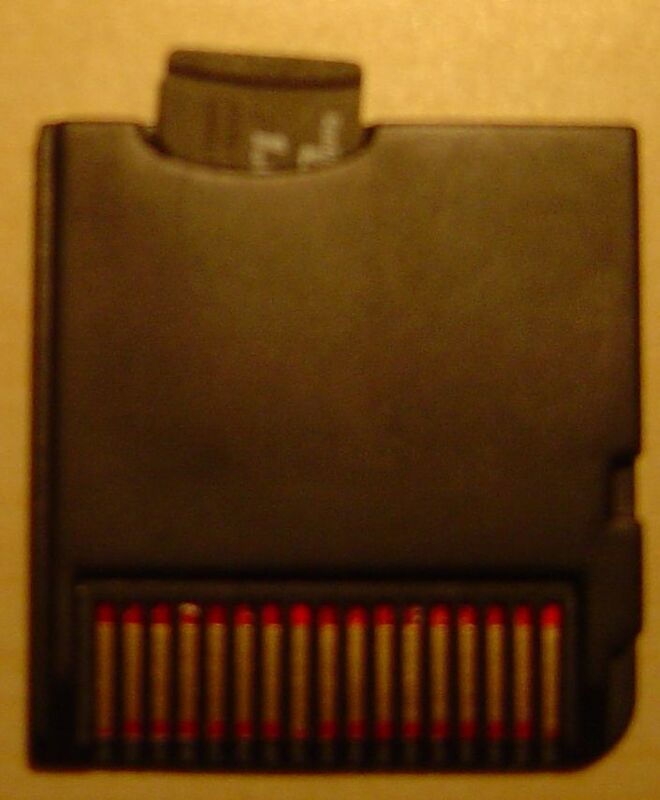 As you can see the MicroSD card is loaded at the top of the card so the DS Cartridge does not need to be removed to gain access to your MicroSD card. The MicroSD card is spring mounted so no need to worry about it slipping out a-la Supercard Lite. All tests were conducted using a Sandisk 1GB MicroSD Ultra II card. First thing I did was grab the latest software from the downloads section and proceeded to upgrade the firmware (Or OS in this case). I formatted my MicroSD card with FAT32. The software comes in the form of a zip file that needs to be extracted onto the root of the MicroSD card. 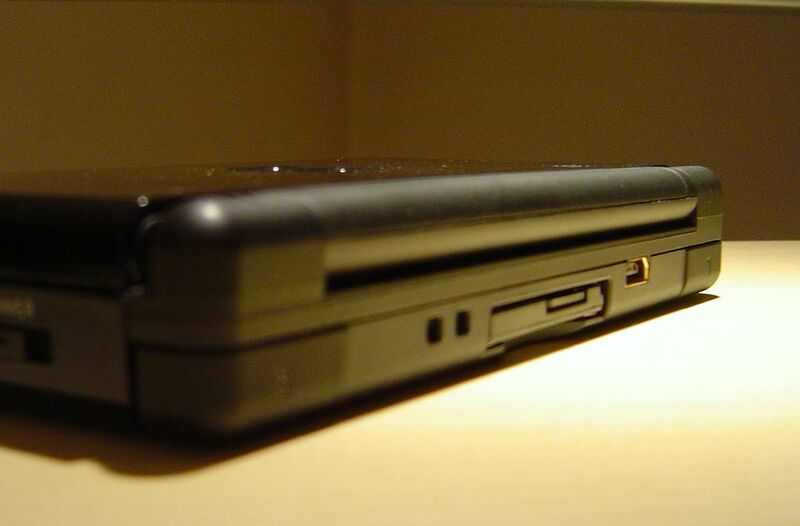 It contains an NDS file and a scshell folder. Easy as pie for users with Microsoft Windows 2000 or above. An SD Card driver for Windows 98 is downloadable from their website. It's got clean rom support so it's just a matter of copy and pasting .NDS files which is great. No need for patching software. One small gripe I have, is that where it's great having removable media, I run Linux which doesn't have great support for SD Card readers, meaning I need to boot back into Windows to copy data across. Not sure what the support is like for Macs. I booted it on my NDS Lite and it booted into a modified version of Moonshell v1.41. 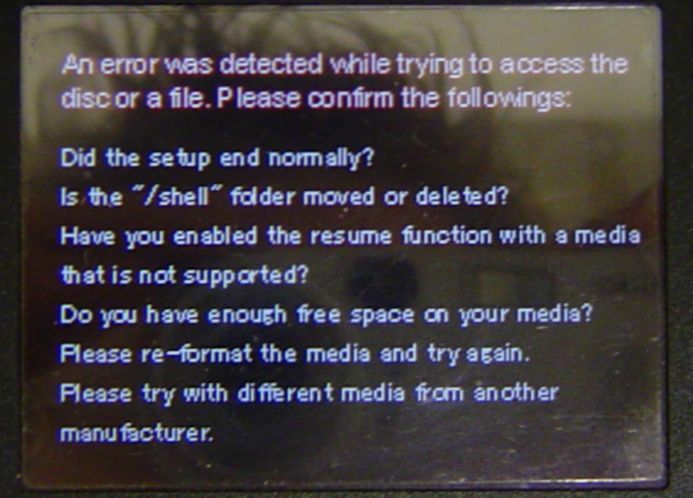 However on each boot I am presented with the following error screen. It's a MoonShell error that I get on my other Slot-1 solution and as far as I know it's safe to ignore. Looks very slick and a screenshot of the default menu is below. A property box is always opened as soon as the directory listing comes up. Not a huge hassle but a little annoying for me. It shows the information for the currently highlighted folder or file. While is does show a lot of information it sits in front of the file listing which means it's a bit awkward to navigate. Also when this box is up it sits in front of the menus as well which isn't great either though it can be removed by pressing the X button. Boasting the same great touch screen capabilities of Moonshell it is a very useable system and as with Moonshell very skinnable. 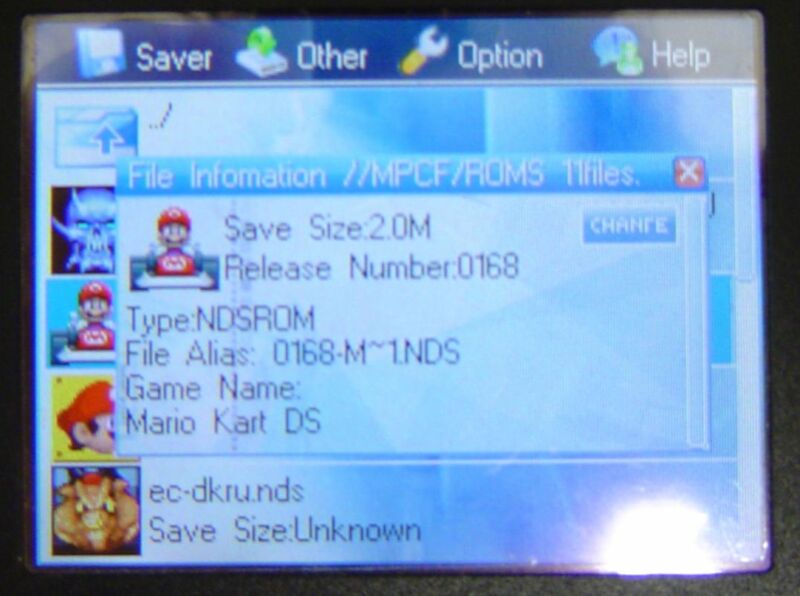 As you can see it grabs the icon file from the NDS file but it doesn't grab the header. Instead it just lists the filename which as you can see with me, some of my backups are named correctly and some have scene names. When the property box is open it will correctly display the first 20 characters of the Rom Name but no more. 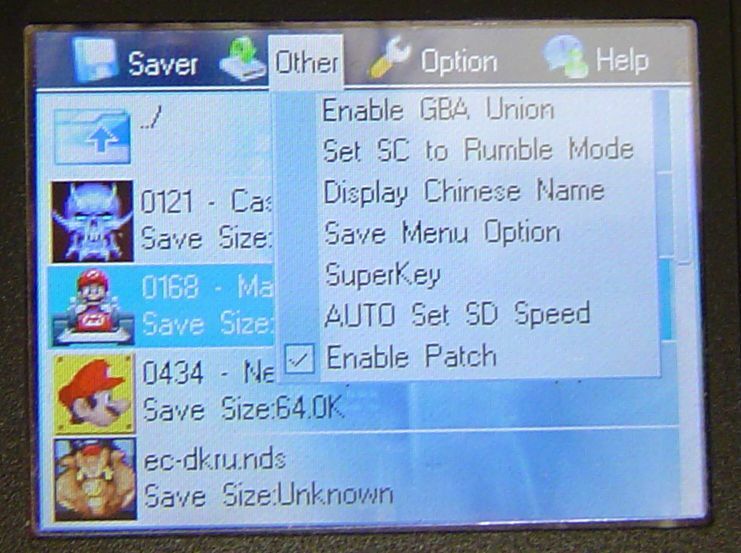 This rom name seems to be controlled by the OS rather than reading the rom header as the new Diddy Kong Racing (Released after the latest OS update) is not correctly named. When scrolling through a number of .NDS files it is fairly slow so hopefully your most frequently used item is at the bottom of the list. Once again a little annoying and frustrating and hopefully some of these are put right as it seems from a hardware point of view they have a very strong product. There are 4 menus across the top of the screen which I will detail below. The Saver menu is very basic. You can manually change the size of the .SAV file to 4K / 64K / 512K / 2M /4M. The .SAV situation is explained in more detail further down the page. Display Chinese Name - Displays the Chinese Name. Save Menu Option - Saves your current settings for future use. SuperKey - Enables SuperKey use for booting Slot-2 devices. 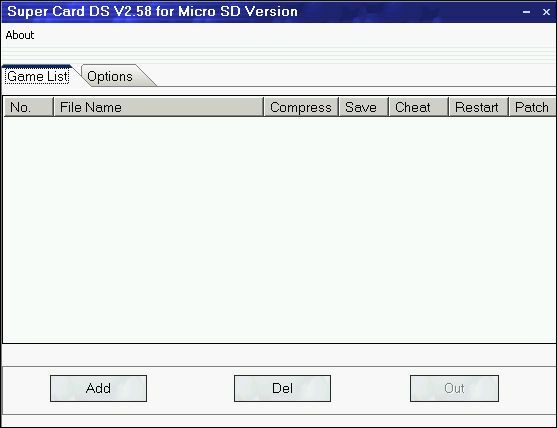 AUTO Set SD Speed - Runs a Test program to determine MicroSD card speed. Enable Patch - Enables Universal Patch options which include Cheats, Reset etc. I found that the intro for Castlevania Dawn of Sorrow runs laggy when normal read is set, but perfectly when fast read is enable. The Reset option also works. But as I mentioned I believe its easier to just left this option disabled unless you need it for compatibility. Displays the Moonshell help menu. Not sure it provides a lot of information but is does make the top menu list a nice round figure of 4. 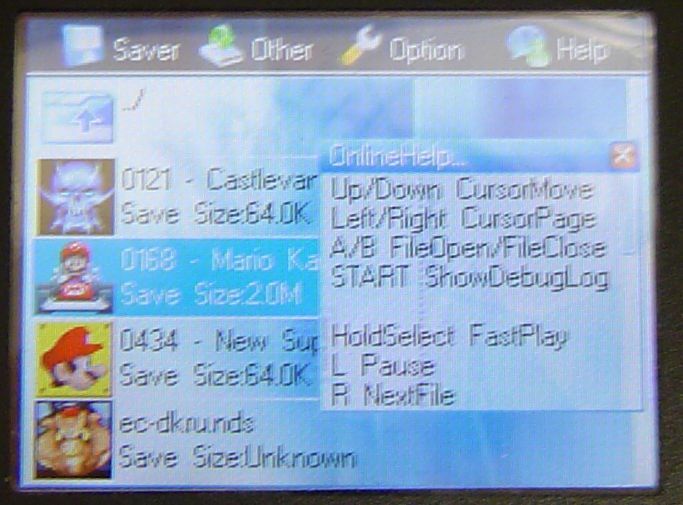 Another small problem I had was that it only takes one click to launch an .NDS file. So no double tapping here. A bit annoying so please be careful when trying to select your .NDS files. Also a loading indicator is not shown (a dialog is present if the property box is active) so there is really no way to know this has happened until suddenly you file loads. As I mentioned the gui is a modified Moonshell. Which means it supports bmp, txt documents and mp3s etc from with the menu. It supports playing music while you browse your MicrosSD card. However playing a 192kbps mp3 whilst looking through my directories results in a very unpleasant experience. Sounds okay when you are not moving between items, but if you are it skips a bit. Maybe they could enable the midi plugin and have some selectable music. 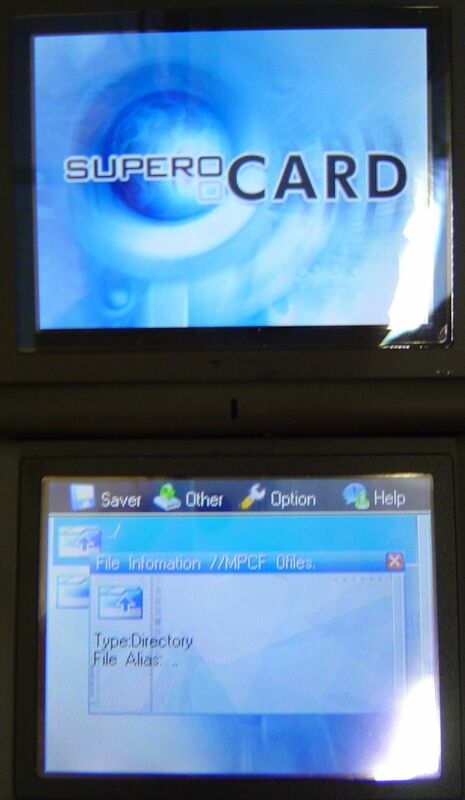 You can download the Supercard DS Software from here that provides patching options for your "clean roms". However I haven't used the software and I believe with the new OS Version this is fairly obsolete now. Either way it's there as an option. Below are a couple of standard screenshots. Bad thing is they have used the same software as they use for the supercard lite by the looks of it with GBA patching options when you canÂ´t even play gba roms on the supercard DS. Are they trying to confuse new people or what. To be honest, they should probably just pull that download as all the patching can be done on the DS itself. How does it handle SAV files? Saves are handled automatically. 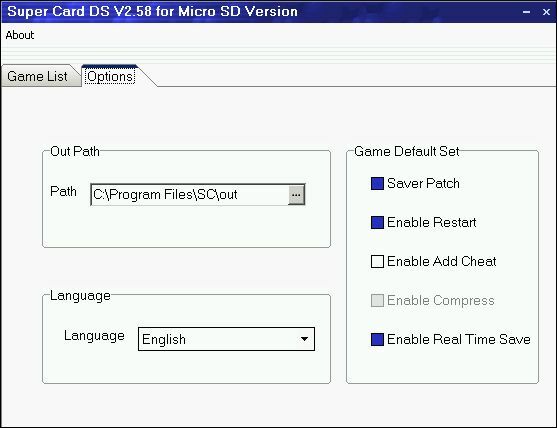 The Supercard team has a database built into the OS version so any game released before the OS should have an entry thus setting up the SAV file correctly. 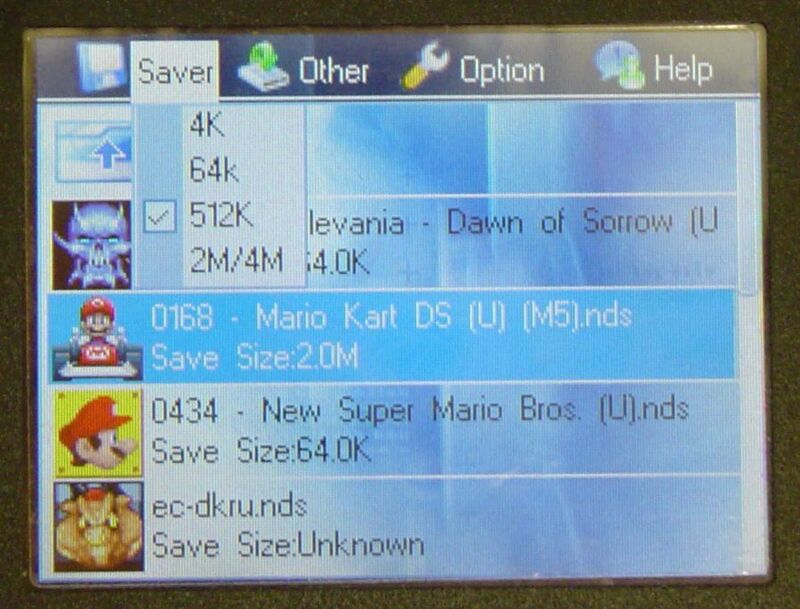 The SAV files themselves are stored in the same folder as the NDS file it relates to. For testing purposes I tested the SAV file creation with Diddy Kong Racing (Released after latest OS update) and the SAV file was created perfectly fine. 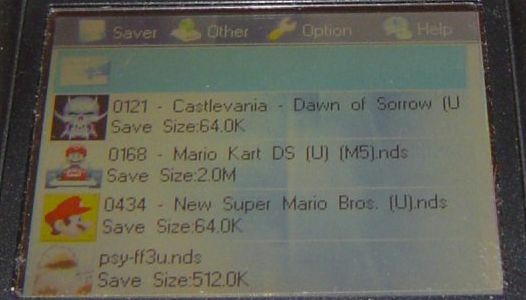 You can alter it to save on to a DS card which means that if a game does not save, then fails to save using the force save size, you can then try saving directly to a DS card with the same save size. The SAV size is displayed when the property box is active or when the ICO Modality is set to Big. The supplied setting (Controlled by the Supercard team) can be overridden but I think I will trust the Supercard team for the moment. Overall a very solid effort considering it's the first SLOT-1 device released by the Supercard team. It does what it set out to do. It plays the majority of games and homebrew without the need for patching. But to be honest all this is expected from all the SLOT-1 devices released now. I have a few gripes with the system. I would like the option to individually set each roms patching options on my MicroSD card. That way I don't have to go about trying to remember what settings I used in the previous game. I also didn't like the one click to load an NDS file. It just means that an accidental slip means I have to reset and start again. The interface they have chosen is not completely functional at the moment, but it offers such great flexibility that I expect a lot more to come of their OS. There are a few little issues but on the whole it uses the touch screen effectively and the added bonus is that you don't need to load up any additional media players. This card has a lot of potential and I hope it is realised. However in the world of Slot-1 Devices with 100% rom support and near perfect homebrew support the device makers really need to step up to earn your hard earned cash. I'm sure the Supercard team will make a good go of this. I can't say definitely buy this, but I think it compares well with the R4 DS and the M3 Simply. All 3 have come out recently and I think if you compare all 3 products and the reviews here on this site and others you will find a Slot-1 device that meets all your needs. It's currently retailing for $54.95 USD over at Kicktrading so it's not an overly expensive product. + Excellent build quality. Card fits flush in the DS and slides in and out as if a commercial card. + No patching required, just drag and drop to play 100% of games. + MicroSD slot is spring loaded. + Works as a passcard device allowing booting of devices in Slot 2. + Homebrew compatibility growing due to DLDI implementations. - Requires some work to set up out of the box. No Software included via CD so needs to be downloaded from internet. - Minor problems experienced with some games from test. - Future problems could arise with the current SAV system in place. - PC Software is not relevant to the Supercard DS and is obsolete. Great review.... it makes me happy I got the m3 simply. I just think its a better system overall, but thats why reviews exist!! Muggs what version SC1 do you have? Does the chip stick out, in, etc? "Signature removed - Advertising that site is not allowed"
I originally planned to get a SCDS when they came back in stock at RHS, but I got impatient waiting for them and I bought an R4 (from RHS) which I should receive sometime between the 21 and 23. One issue that worries me about the SCDS is how it REQUIRES a high-speed flashcart for many games. My choice in flashcarts (Transcend) aren´t liked at all by the SCDS. You get some message about it being too slow and not usable on the SCDS, so I changed my mind and went with the R4 because it´s OK with slower flashcards. 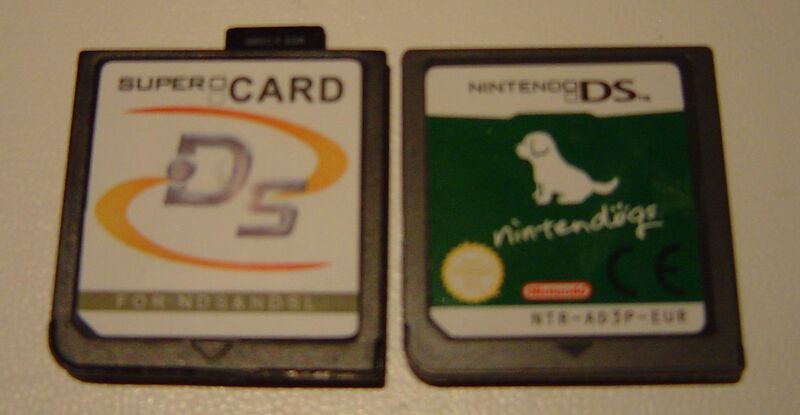 I´m not overly worried about PoR/DoS issues though....I own the actual carts of those, so I´m good. it says 100% rom compatibility, does that mean download play too? Performed 11 Queries in 0.00634 Seconds. The page rendered in 1.18621 Seconds.